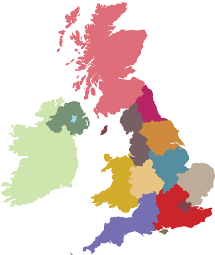 To Find an Accredited Partner in your Area, click on your region or use the map to search. Once you have selected a region, you will be presented with a list of accredited partners that operate within that region. By following the links provided, you can find out more about the company , their specialisms, their customers and even their qualified staff. Our Accredited Partner Programme is for professional installation companies committed to providing quality loop installations that will satisfy the latest Loop system performance standard IEC60118-4:2006, impress Facility Managers and delight hearing aid users. To achieve accreditation, the staff responsible for the design and commissioning of loop systems within the company must attend and pass the UnivoxAudio or ISCE Induction Loop Training Course. Their first installation will be inspected by us and if approved they will receive accredited partner status. Thereafter, each year we will require copies of 3 installation certificates countersigned by their clients. Further installation inspections will be made every 2 years. Accredited Partners get exclusive access to the latest in loop design software, free technical support, free design service, discounted equipment and free promotion on the UnivoxAudio website whilst Facility Managers get peace of mind knowing that an Accredited Partner will provide a quality installation that meets the international performance standard. I'm a facility manager and I want to find out more about your Accredited Partner Programme. Do you share our vision and passion for helping hard of hearing people? We are actively seeking strategic partners to help us create a better future for people with hearing loss and raise standards generally. We are particularly interested in installation companies who are recognised experts in their field, have a good reputation and a commitment to customer excellence.